Demonstrates it will be possible to meet IMO's 40% reduction target by 2030, project partners claim. Project Forward - a 2015-launched joint initiative comprising the American Bureau of Shipping (ABS), Arista Shipping, Deltamarin, GTT and Wartsila originally aimed at developing a dry bulk carrier concept employing LNG as fuel - claims its concept vessel shows that it will be possible to meet the IMO's target for a 40 percent reduction in carbon intensity by 2030. Model tests of the project's concept vessel are said to indicate that the Energy Efficiency Design Index (EEDI) - which reflects the CO2 emissions per transport work and is a measure of carbon intensity - is well below the currently most stringent Phase III level, which is applicable to ships built after 2025 and signifies a 30 percent reduction from the 2008 reference level. 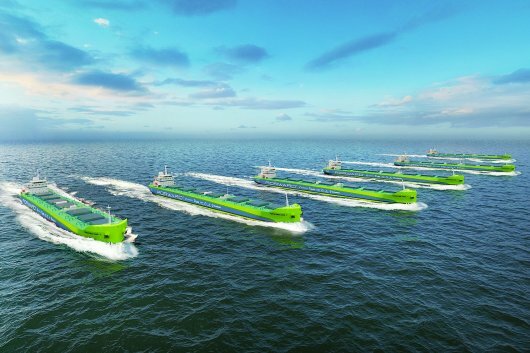 And Project Forward says this 70 percent reduction in CO2 emissions target can be met, even without lowering service speeds, through the use of carbon-neutral fuels mixed with LNG. The concept vessel's hull form has been optimised in cooperation with Finnish ship designer Deltamarin and classification society ABS, whilst the propulsion design concept is based on a novel arrangement featuring just two Wartsila 31DF engines without auxiliary gensets. The vessel is also fitted with an LNG tank, positioned midship, developed by French membrane containment system designer GTT.